The Stratford-KW system was generating $17,000 a month, and soon the other systems across Ontario were earning similar revenues. Stix and Schnarr rented a big house with an indoor pool, had some buddies move in, and lived the high life. “We thought we’d reached it. This was the mecca.” Schnarr says. But they kept being asked the same question: Will you ever link these separate regions together?In those days, it was impossible. The service would have to go through Bell, making it too expensive. “Then along comes the internet.” Schnarr says. Always poised to embrace the latest technology, Stix and Schnarr scoured the U.S. for parts, made a voice-over-internet-protocol (VoIP) box, and became the second people in the world to announce they had channeled a call via the internet. Again, they decided to start with a freemium model. But this time they needed someone with deep pockets to fund the infrastructure. Labatt jumped at the chance, and together they created the Labatt Blue Line. It was a huge success – gaining 340,000 customers in 14 months – and in the end, that’s what killed it. So many people were using the line that Labatt could no longer afford the three-cents-per-call deal it had struck. So in 2000, the founders again turned it into a paid service. A year after that, they sold the company and decided to move on with their lives. After three months, Stix and Schnarr were bored. They also felt like they hadn’t accomplished all of their goals. “We felt we had learned so much about how to compete against the big telco brands in Canada that we had a strategic advantage if we were to do it again,” Stix says. So they entered the fray and joined forces with another old business friend, Mike Brown. They didn’t want to use anyone else’s networks, though. In order to do that, they needed the CRTC designation of Competitive Local-Exchange Carrier (CLEC), the highest certification available. It was an arduous process, especially for the fly-by-the-seat-of-their-pants duo used to pivoting at a moment’s notice. But they secured the certification, bought a system they could deploy across the country, and also launched a dial-up internet company in order to meet CLEC requirements to have a trafficked network. Again, they went for the jugular on pricing. Dial-up internet was $20 to $25 a month back then. 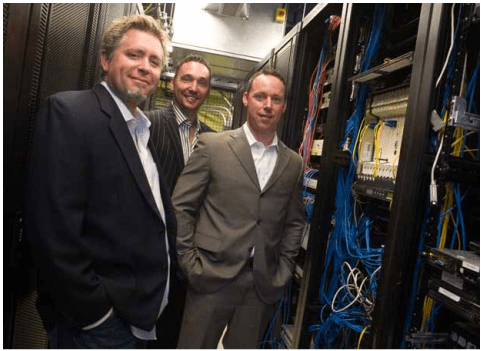 Fibernetics offered it for $2.95, and quickly became the fastest growing dial-up company in Canada. “We learned that a free customer, if marketed to correctly and had the right services and value shown to them, a certain percentage would leave the free service and take our paid service,” Stix says. “The free service accumulates customers, aggregates a large database of customers, instills them with goodwill, allows them to get used to your network and your business, and you can walk them up the ladder. Today, Fibernetics is betting that old-fashioned telephone technology won’t exist within a decade. Everything will be data. So, again, the company is embracing the future: Voice is being erased from its offerings. “If you control the pipe into the house or business, it’s all going to be about data. Voice is just going to be part of data.” Schnarr says. There are 26 million mobile phones in Canada. In 2011, Canadians paid $10 billion in voice charges, Stix says, “the highest amount of money per capita in the world.” Long-distance and data are on top of that. Fibernetics developed a computer application that turns a computer into a free phone line. They started with a limited offer in Toronto, and their initial 500 customers quickly turned into 1,000, then 2,000, then 10,000. It was a good sign. They came up with a new name for the service, calling it Fongo and spun it out into its own separate company. When it launched, the app hit the top of the Apple iStore chart. Now, there are over 250,000 active users, giving Fongo well over five per cent market share in Canada. Fibernetics simultaneously targeted the business market as well, creating NEWT™, a private branch exchange (PBX) that essentially eliminates the phone line. As an example, instead of a business paying for 12 phone lines, a business can buy or lease a Newt PBX and not pay for a phone line again. All voice traffic is managed over a dedicated connection and quality is not compromised. Fibernetics believes that Newt is the only company in North America that is a regulated carrier, a network provider and has also developed their own PBX platform. Word is catching on, as Newt is now deployed in over 1,500 businesses. 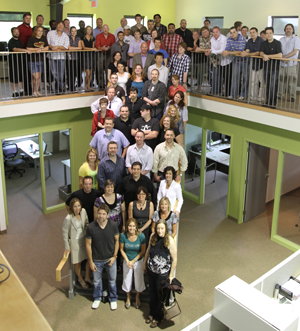 With software developers based in Sofia, Bulgaria, a call centre in the Dominican Republic, and at head office in Cambridge, Ontario, Fibernetics is expected to crest $30 million in annual revenue in 2013, with no institutional investment, and is a diversified company routing millions of calls per day on its network. “Where does the future lie?” Stix was asked. “We have a culture we’re trying to create here with over 200 employees and have added key leadership like our new President and CFO Roy Graydon. People care here about our community, people love to come to work and if we hire correctly and people can feel that culture correctly, and people can feel our passion and understand our vision, there’s no reason this business here in Cambridge can’t be the next great business out of this community. This entry was posted in Fibernetics on March 15, 2013 by newt@fibernetics.ca. It was meant to be a recipe for disaster. Two best friends, barely into their 20’s, wading into the world of telecommunications just as deregulation rolled out across Canada in the mid-1990s. Everyone around them warned them off. Don’t go into business with a friend, they said. Go get a real job. Almost 20 years later, Jody Schnarr and John Stix having navigated the changing telecommunications landscape, changing course with the current, to create the fastest-growing cellphone company by subscribers in Canada. Needless to say, the detractors have long since gone quiet. For Schnarr and Stix, the visionaries behind Cambridge-based Fibernetics, it all started with a telemarketing job. Schnarr, forced to work the phones due to a back injury, met Stix for their regular Thursday-night pint and started talking about what he was selling. Bell was no longer the lone telephone carrier in Canada, he said, and Schnarr was calling people to offer a different, cheaper service. It seemed like everyone he called was saying yes. “This company must be making huge money. We should figure this out,” Schnarr said to Stix. That conversation in 1994 would change their lives, and help transform telecommunications across Canada then and now. The path was far from easy. Their first foray was an investment in an alternative telco called North Phone, which went under not long afterwards. “We lost everything,” says Schnarr. But they learned two valuable lessons: First, they would rather invest in themselves than in someone else. Second, to be successful they had to break new ground. Those two lessons would steer them through the decades to come. They started by setting their sights on introducing flat-rate long-distance calling to southern Ontario.“With Communitech and the Accelerator Centre, you can learn so easily now. Back then, it was so hard,” Schnarr says. They developed a PC-based switch to route calls between their hometown of Kitchener-Waterloo and Stratford, ON, a distance of less than 50 kilometres, but in the 1990s still classified as long distance. They needed $15,000 to buy the equipment, had no idea how to write a business plan, and were out of funds of their own. So they followed advice in an article Schnarr read: Seek support outside your home community. They went to Stratford, explained the idea, and secured a loan from TD Bank. Then the duo started knocking on doors to gauge public response. Stix and Schnarr launched their business called Stratford Telecom in 1995. No one switched. They were dumbfounded. Still, they kept knocking on doors, and landed 75 customers in their first month. It wasn’t enough to cover the rent of their tiny Kitchener office. “We were going out of business,” Stix says. Then he had an epiphany. Forget “too good be to true”. They needed “too good to resist”. They needed to make it free. A local radio station was paying for families to call each other over the Christmas period, and people were “freaking out” about getting free long distance. Schnarr and Stix latched onto the idea. If they could make all calls in the region free, everyone would want to use it. And then some might even be willing to pay. But how to cover their costs at the start? Again, they took their cue from radio. They would start each phone call with a 30-second ad. Car dealership owner Gary Stockie took the chance, and handed over the equivalent of the fledgling company’s monthly business expenses, and use of a car. The day the newspaper article revealed that a new company was offering free calls between the two cities, Stix and Schnarr gained 4,000 customers. That Christmas, Stockie was inundated with cards of thanks. Stix and Schnarr repeated the process in 50 more communities across Ontario.“We thought this is great. All our costs are covered and we’re acquiring massive market share – easily channeled a billion free calls – and we kind of have a decent income, but we should go back to charging these people.” Stix says. They finally worked up the courage to switch back to a paid service, and again started with Stratford. They put a new message at the start of each call: Due to increased costs, they were introducing a modest fee. If users agreed, they could pay an additional $10 on their Bell bill and receive free calling within the region. The day they flipped the switch was tense. Their parents had invested money into the venture too, and they had no idea if anyone would pay for the service. Stix and Schnarr sat in their office waiting for the phone to ring, and monitoring uptake of the new plan. It was silent. Customers were piling up. The phone line was jammed solid. Schnarr reached over to the ghettoblaster and hit Play. “I’ve Got The Power” by Snap surged through the room. This entry was posted in Fibernetics on March 14, 2013 by newt@fibernetics.ca.